Nothing dark and sinister, just trying something new. I was asked awhile back if I ever did my doodles in color, I had not, I really liked the sharp black and white contrast. But I thought maybe it was time to try it to see how it felt. Because everything about doodling is about how it feels. Here's a little sample of my first color project. What do you think? I only used 3 colors, navy, purple and brown. 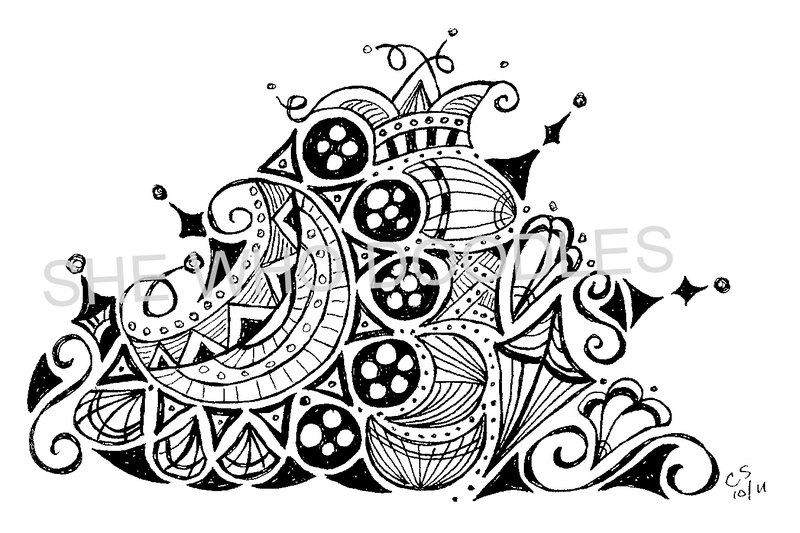 Then finished some of the design by outlining the shapes in black. It's interesting how ones art evolves over time. My current style of doodles is quite different then when I first started. Everything had a triangular shape, and clustered tightly. I've changed pens several times and also change according to the size of journal I am using at the time. Sometimes I go back and look at some of my older designs to pick up some shapes or designs I used in the past that I could incorporate into a new doodle. Hardly a days goes by that I don't do a doodle, I am now using 3 different size journals and some postcards. It is definitively more challenging to work in the larger 18 x 24 journal. It takes several days to finish one of that size plus a much bigger tipped pen. I'm working on one now that I will show you when I finish. I keep looking for products that look good with doodles on them. Trying to find that product that will catch someones eye. It's that time of year that the summer outdoor markets start making plans so need to figure what to sell this year. I did go ahead and register for one here in Vancouver at the English Estate Winery. I've done their Art and Wine Fair the last two years and did okay. It's close to home and a really cool venue. Plus they offer wine samples all day. 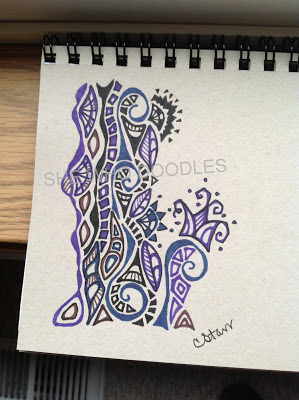 My blog for doodles is still pretty new, if you visit I'd love comments. love doodling .. I am never without pen and paper ... in meetings, while watching tv, etc. Love what I see here ... and really love your blog theme!